Braces are impressive little gadgets. Over time, they move your teeth. But how do they do it? The Ligature Elastic (also called an "o-ring"). This is a small colored elastic that holds the bracket onto the arch wire. The ligatures are usually changed at each adjustment visit. Some types of brackets do not need elastic ligatures (they are called "self-ligating"). 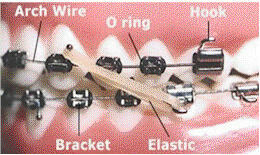 The teeth move when the arch wire puts pressure on the brackets and teeth. Sometimes, springs or rubber bands are used exert more force in a specific direction. Braces exert constant pressure, which over time, move teeth into their proper positions. Occasionally adults may need to wear headgear to keep certain teeth from moving (see A Few Words About Headgear for more information). Your teeth are surrounded on top by gum tissue (also called Gingiva). Under the gum tissue, the Periodontal Membrane (sometimes called the Periodontal Ligament or PDL) encases the bottom portion of the tooth. Next to that lies Alveolar Bone. When braces put pressure on your teeth, the periodontal membrane stretches on one side and is compressed on the other. This loosens the tooth. The bone then grows in to support the tooth in its new position. Technically, this is called bone remodeling. Bone remodeling is a biomechanical process responsible for making bones stronger in response to sustained load-bearing activity and weaker in the absence of carrying a load. Bones are made of cells called osteoclasts and osteoblasts. Bone remodeling works like this: increase the load on a bone and osteoclasts are created which break it down in response to the load. Remove the load and osteoblasts are created which create new bony cells. Repeat the process through repetitive motion and eventually the bone density increases. Your teeth are socketed in bone (your maxilla for the upper teeth, and your mandible for your lower teeth). 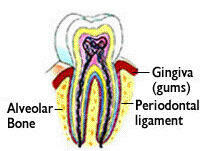 As mentioned, surrounding each tooth is a Periodontal Ligament (PDL) which attaches it to the surrounding bone. The PDL as a sort of messenger between the teeth and surrounding bony sockets. Pressure between the PDL and bone causes the bone to create osteoclasts and breakdown the bone to restore the normal spacing between the teeth and bone. The corresponding tension on the PDL behind the movement causes the bone to create osteoblasts, effectively building new bone to fill in the difference and restore the normal spacing between teeth and bone. Not a whole lot of force is necessary, only "some" force which is not normally present. Enter the brackets and arch wire - the artificial force needed to create and sustain the pressure. Arch wires are interesting things in that they tend to want to retain their normal shape. They are also made of materials activated by body heat to increase stiffness. The wire you have presently is what is called a twist wire which is like a small cable. It wants to remain straight. When it is put onto your teeth which as a braces patient are all over the place, and activated by the heat of your mouth which is 20-25 degrees above room temperature, its desire to remain straight provides the forces necessary to get the biomechanical process of bone remodeling to begin and continue. The solid wires which come later are made of a nickel-titanium alloy and while so flexible that you can tie a knot in it, once activated by body heat becomes quite stiff. The strategic placement of brackets on teeth and tying of those brackets to this wire complete the transmission of forces from the arch wire to the teeth and sustained result in the awesome process of bone remodeling as your teeth are moved to new positions in your mouth. The osteoclast (breakdown) process takes about 72 hours to get fully going, the osteoblast (rebuild) process about 90 days. Stabilizing the result takes about 10 months (which is why it is important to wear your retainer to avoid a relapse of the original or some intermediate positions).